The corpuscular nature of the light can be detected by means of the photon counting technique, realized with a photomultiplier tube. The “photon counting” technique has already been described in the post Light as a Particle, in which we used a special photon counter and a pulsed light source. 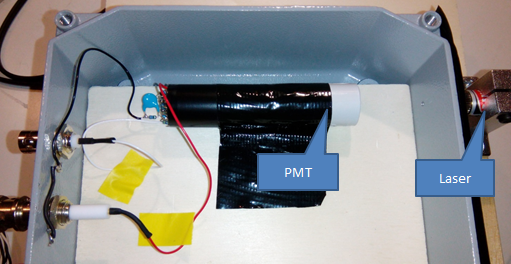 In this post we describe a similar device to achieve photon-counting of weak light sources. We adopted the photomultiplier Hamamatsu model R647 . 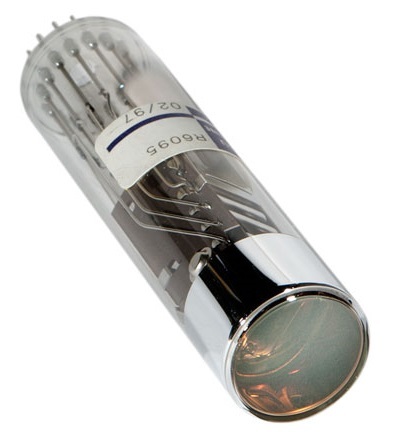 The photomultiplier tube has been inserted inside a light-tight metal container : the “dark box”. 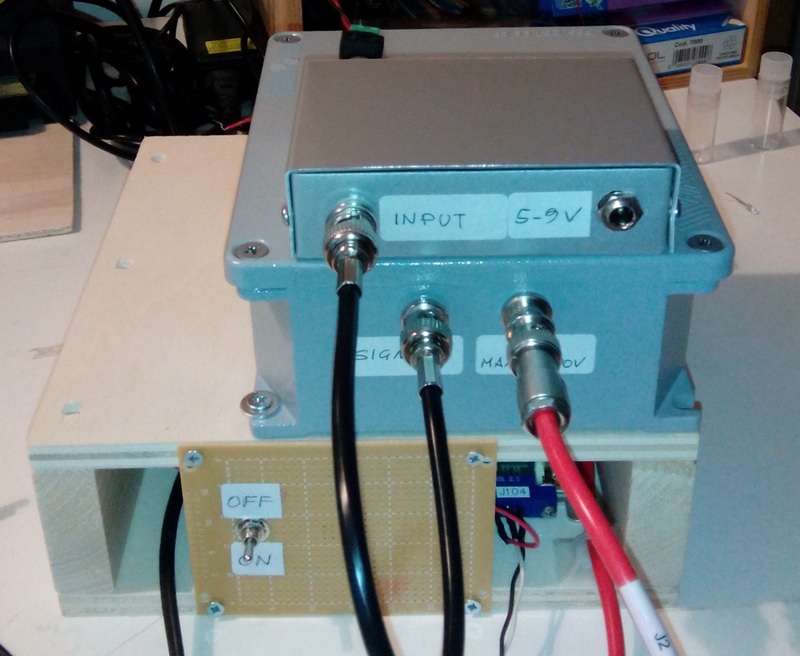 On one side of the box the BNC connectors have been positioned to supply the PMT tube and to pick up the signal from the anode . On the opposite side (in front of the photocathode) a tiny hole (pin hole) has been drilled so as to permit the light (adequately screened) coming from the outside to reach the photocathode. For the power supply of the PMT a commercial Matsusada HV generator has been used, it is capable of generating a high negative voltage, it is stabilized and the voltage is adjustable, up to a maximum of 3kV. These generators can be found quite easily on the eBay market. For this realization we choose to place the anode to ground and the cathode to negative potential so it needs to be isolated. In the image below it is shown the voltage divider scheme and a picture of Matsusada J4-3N-LX generator. The signal is taken directly from the anode, without the decoupling capacitor, because the anode has zero potential. 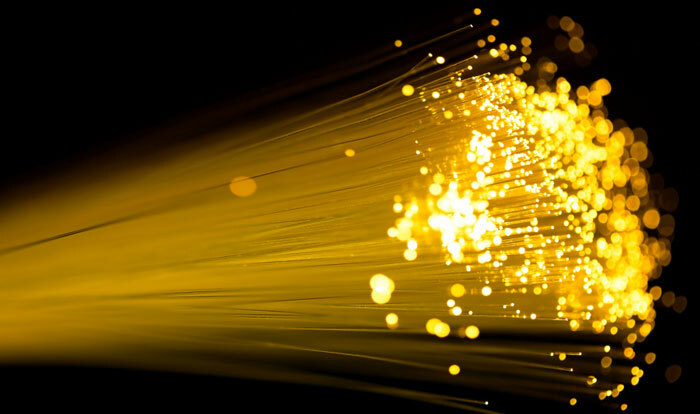 The advantages of this type of connection are “cleaner” signals and the possibility to operate also in continuous regime for the measurement of weak light sources. 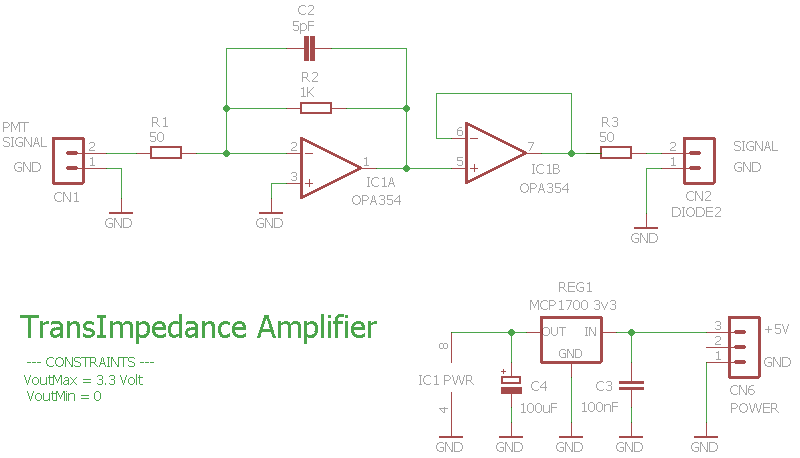 The signal taken from the anode is sent to a transimpedance amplifier followed by a buffer stage, both the input and output resistance has been set at 50Ω output. 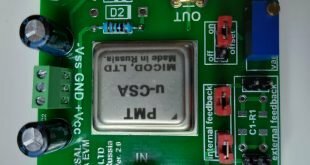 As operational amplifier the OPA354 model of TI has been used, CMOS rail-to-rail, characterized by a band of 100MHz and low noise. 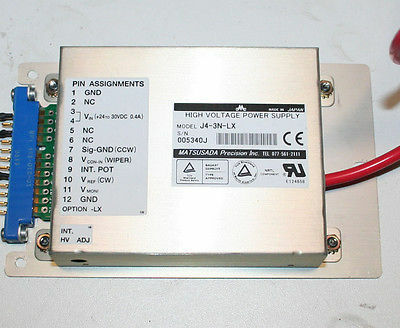 The amplifier is powered at 3.3V obtained by the MCP1700 regulator 3v3. In the image below there is the amplifier scheme. 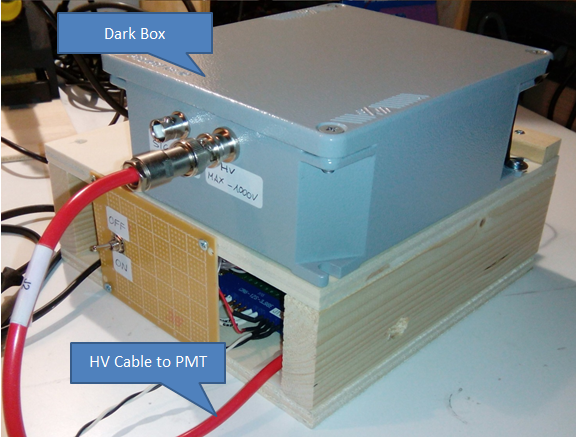 High voltage power supply, dark box and amplifier were placed in a wooden structure as shown in the images below. On the perforated side of the dark box it was placed a screen constituted by a inactinic glass (used in the masks for welders) and in front of this, at the same height of the hole, a red laser diode emitting at 650nm has been placed. 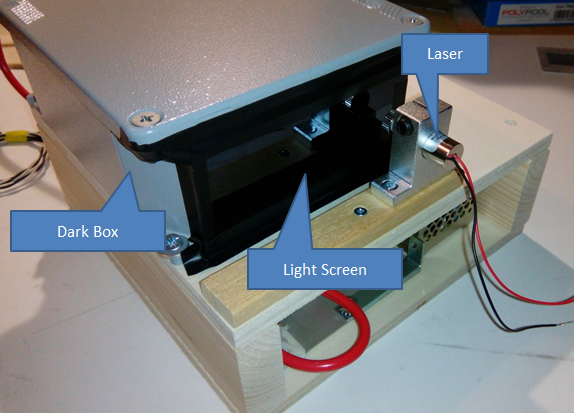 By using the red laser diode positioned outside of the dark box and directed towards the pin hole, appropriately shielded with the filter, we did a photon count tests for different laser beam intensity. As can be seen from the images of the signals acquired by the oscilloscope, a high intensity beam corresponds to pulses of high amplitude and frequency of 5 MHz – 8 MHz, decreasing the intensity of the beam the amplitude of the pulses decreases and the frequency reaches about 500kHz. To further shield the laser beam a polarizing filter can be used. The laser light is polarized, thus rotating the filter the intensity of the beam can be varied continuously to obtain a frequency of a few pulses per second, as you can see in the image below, which shows a single pulse. 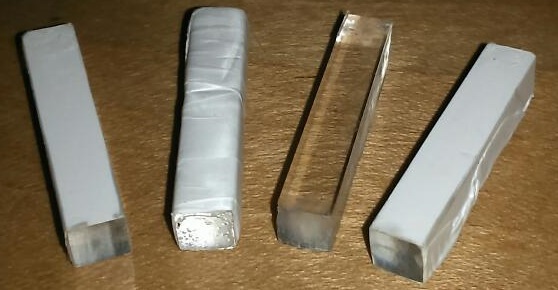 We did a test with a scintillator of zinc sulfide activated with silver, excited by alpha emission of a capsule of americium, all located inside the dark box close to the photocathode. We did a test with a LYSO scintillator crystal excited by his own intrinsic radioactivity, the crystal was placed inside the dark box close to the photocathode.